The inflatable Hot Tub is the ideal remedy for a stressful or exhausting workday. 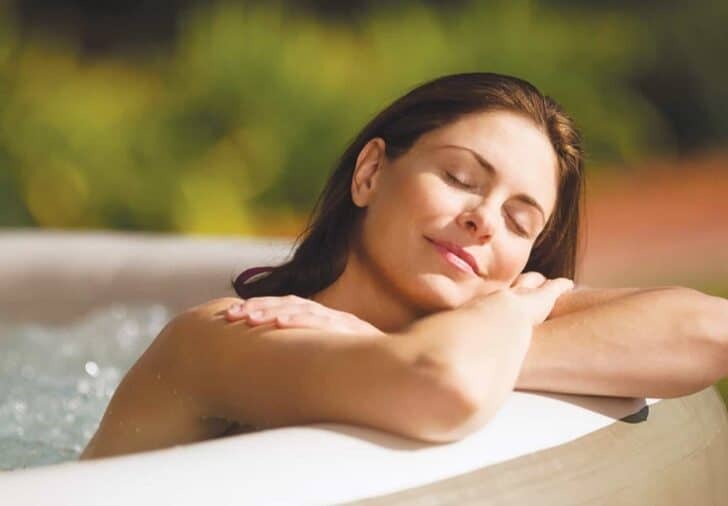 Hot Tubs create a perfect moment of peaceful relaxation at home. Imagine a pleasant family gathering place without all the electronic gadgets that distract us nonstop! Who hasn't dreamed of having a real spa at home? A place to enjoy on a quiet night with that someone special and a favorite beverage? But the price, difficult installation and operating costs can easily dissuade someone. Many Portable Hot Tub products don't need special wiring. Plug them into your standard home outlets without expensive installation for 220-volts, separate fuse panels and more. Designed with ease of installation means that they're more accessible to the masses! With inflatable models, they can be purchased, loaded into your car, and set up by a single person! How can an inflatable Hot Tub benefit your health? The shape: oval, round, square. The inflatable spa (or inflatable Hot Tub) easily meet your relaxation needs. Embedded technology makes portable spas a viable hydrotherapy and balneotherapy device. Additionally, inflatable spas are ultra-simple to install and maintain! Nowadays, prices are lowering, while the quality of inflatable spas increases, making them affordable for the masses! Life can sometimes be so stressful, so be sure to give yourself and your family moments of relaxation! Buying an inflatable hot tub allows you to have the benefits of traditional spas without the disadvantages of older styles. They're now easy to use, easy to install and at a lower price than a standard hottub. The benefits of hydrotherapy are proven. 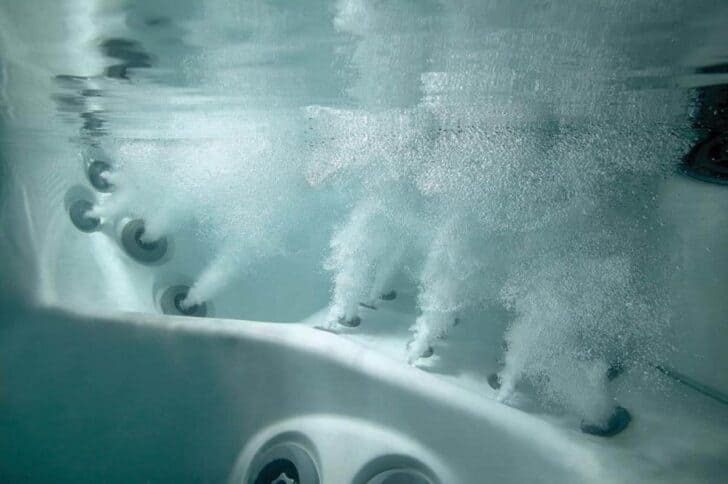 Thanks to the pressure and warmth of the water when using an inflatable hot tub, all the muscles in your body relax, resulting in a feeling of calm and relaxation without equal. Picture yourself relaxing in your own warm, bubbling oasis! With these portable spa ideas, you'll find one that fits your home and budget! If you suffer from stress or muscular pain (back pain, neck pain, etc. 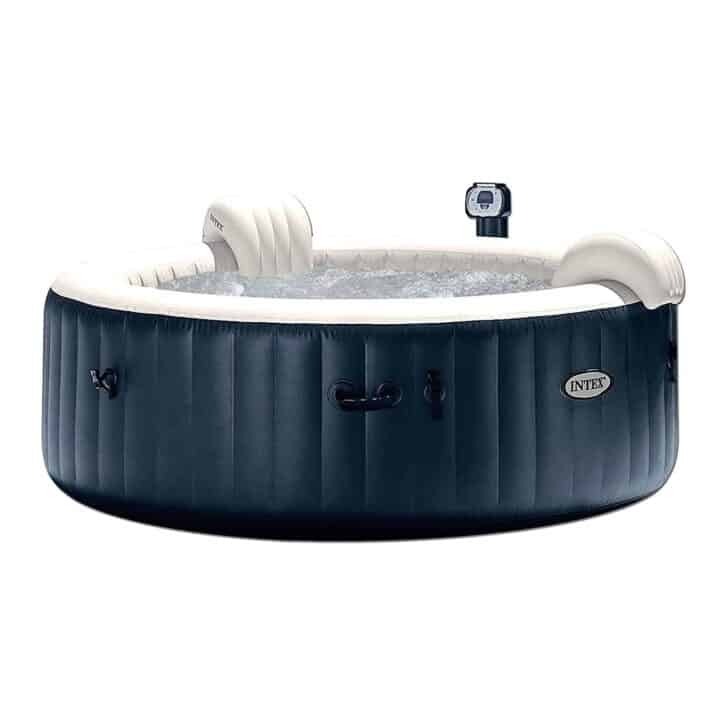 ), the use of an inflatable hot tub will relax you deeply and gently. Massages are great, but sometimes the massage therapist can be too intense for your tender muscles, leaving you aching and sore the next day. Not so with a swim spa! The purchase of an inflatable spa is an investment for your health. In some cases, a hot tub can be covered by your insurance when other therapies have failed. You'll have to work with your medical professionals, though, and it takes a while to authorize. Using the jets to get a reflexology massage on your feet which can stimulate an overall feeling of well-being and mood-boosting benefits. Easing muscle pain: The water allows for high-pressure hydro-massage that you direct to specific parts of the body by moving around smoothly. The jets can provide relaxation benefits similar to a deep-tissue massage, soothing those aches and pains. Hottub therapy can speed healing for sports injuries as the heat reduces muscle spasms and dilates vessels, getting blood to injured areas! Improves circulation: The heat raises body temperature, which dilates blood vessels. Dilated vessels improve blood flow, in particular to the extremities. People with arthritis report improved movement and less pain in their joints. A soak can leave you feeling invigorated and enhance the health of your lungs and heart, too! To answer the question "Which inflatable spa to choose? ", you must identify your needs and prioritize them. 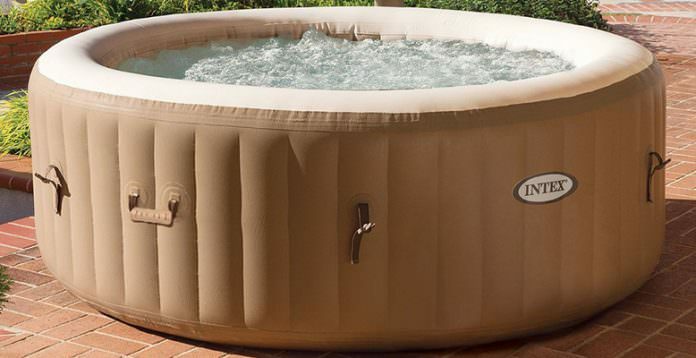 You will discover, choosing an inflatable hot tub requires saving a bit amount of money, about a minimum $300., and therefore is an investment. That's why we recommend that you carefully read our guide. With the best possible information, you'll be well-informed about the options that matter to YOU before purchasing! Keep in mind that the best inflatable spa will be the one that meets your expectations and meets your criteria! You must be well-informed before purchasing. Several features need consideration when choosing your inflatable spa, so let's review them now! 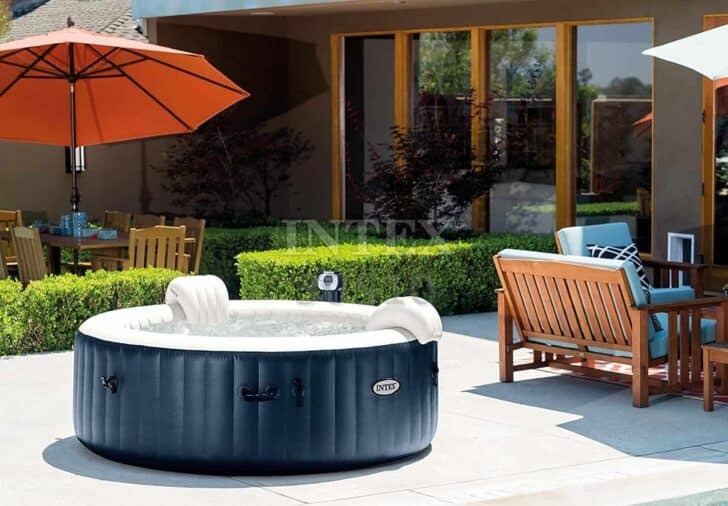 To identify the size of the inflatable hot tub for your family, here are the different sizes of inflatable spas that you will find on the market. Best suited for singles or a couple without children. They take up little space; Place it on a terrace or balcony. The disadvantage is that they are too small for families. 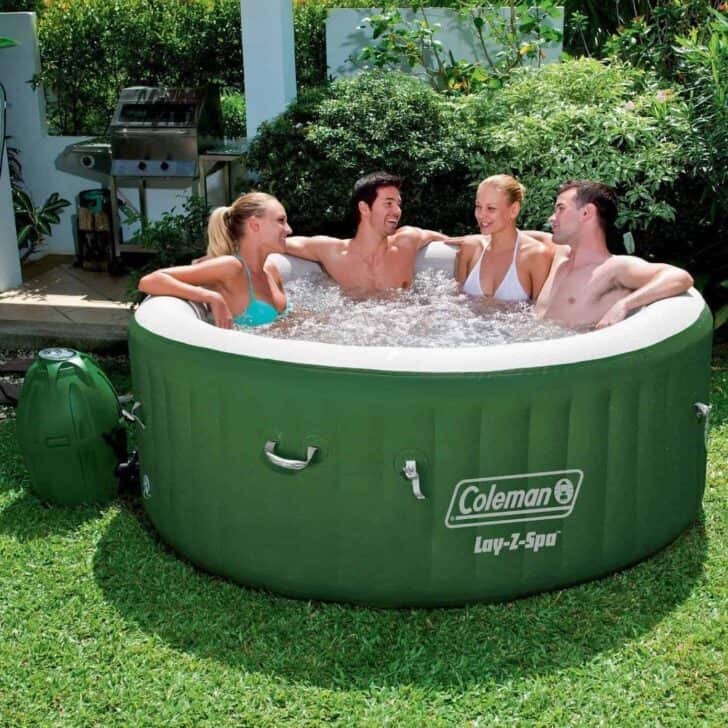 4-person hot tub: two adults and 2 children or 3 adults. Great for couples who wish to enjoy greater space. Using a four-seater spa for two will allow you to lie down and make the most of your hot tub. Disadvantages: a slightly higher cost of maintenance/water due to increased size. Maybe too large for older balconies or terraces. 4 adults and two children or 5 adults. If you have children or you regularly invite people to your home, go for a 6-seat inflatable spa. You don't want to feel squished in your hottub. Don't forget the occasional visits from distant family or friends who will be delighted to want to enjoy the benefits of the inflatable hot tub! 8-to-10-person Inflatable Hot Tub: Can fit up to 9 adults comfortably, or a mixed-family of 10 comfortably. They are roomy for families of 4 to 6 people to enjoy a larger space. Disadvantages include a higher price tag, higher maintenance costs, higher cost of the initial filling. The size of the inflatable hot tub is indeed a critical element that needs to be carefully thought out. You have to consider the total number of people who will use the portable hottub. Or, keep your new purchase a secret! The size and brand will change the price accordingly. If you buy additional features, that also increases the cost. I got a Portable Hot Tub for $50 bucks! Beware of a mega-deal: If you find a $300.00 price tag on a 6-to-10 person inflatable spa, beware! Given the size of the tub, the price is a red flag! Do your research on the well-known sales sites and know what the average cost is. Be aware of increased costs for additional features. That "bargain" spa may have insufficient jets to provide comfort, which will cost you more money long-term to replace it. The price issue is also important regarding the inflatable hot tub. Define your needs to see if they fit your budget or not; the price is a decisive criterion in your decision-making process. Be aware that there are inflatable spas with a wide variety of prices, from cheap for entry-level purchases, to "fully-loaded" models. Consider start-up and long-term costs. Inflatable spas typically consume less electricity than conventional tubs. A smaller hot tub will require less water, and a shorter heat-up time, which costs less than massive whirlpools. The Portable Hottub design aims towards comfort. Other styles focus on relaxation features, such as inflatable spas with hydro jets. Hydrojets are useful for deep relaxation of the muscles and overall satisfaction. Read customer reviews and publications about the brands you're considering. Cheap spas under $300 may not be reliable. Intex hot tubs are the cheapest. The bubble technology performs a global action on the whole body but doesn't offer a targeted jet in a particular zone. These types of spas are more budget-friendly but don't provide targeted action. The hydro jet technology makes it possible to direct the action of the jet of hot water to the area that it is desired to treat. Aimable jets are advantageous when you want to guide the jets to your lower back, hip, ankle or other areas. Hydrojet technology is the closest thing to a real spa you'll find. These characteristics are essential to identify when you decide to buy your inflatable spa as they involve a different product approach. In summary, the transportable bubble spa will be more linked to a relaxing activity, while the hydro jet a more targeted therapeutic approach. Pick the style that is best suited to your needs or the needs of a family member. The influx of inflatable spa manufacturers has led to innovations in functionality, aesthetics, and design. Many colors, coatings, and shapes are available today. Choose the style that suits your indoor or garden decor. Be aware of the different shapes and styles that are available, including the classic round, oval and square spas. There's not an advantage of one configuration over another, so it's up to your personal preference. As with any purchase, knowing the name of the product is always important. Some leading manufacturers of inflatable spas are known for high-quality products. 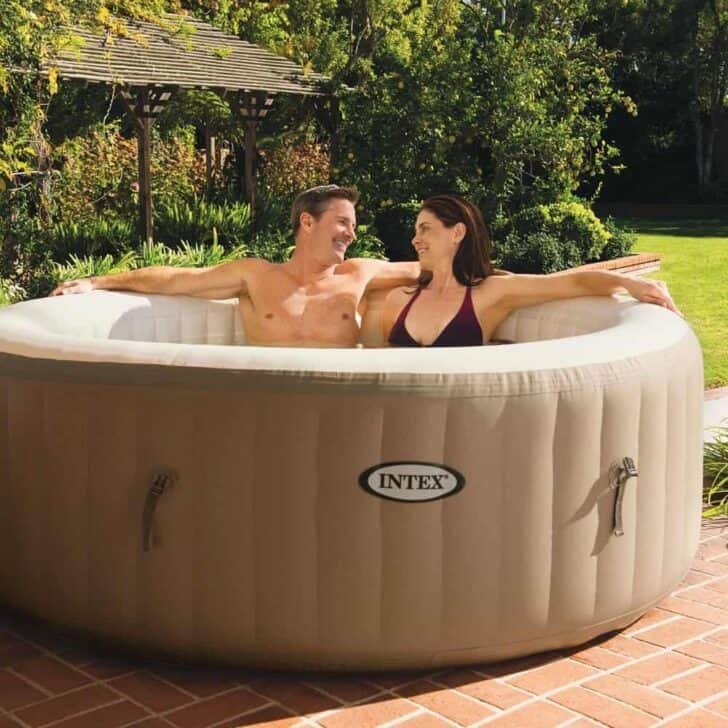 Intex is a well-known manufacturer in the inflatable hot tub market. Also, buying an Intex inflatable spa will guarantee you of unparalleled quality regarding your device. Indeed, Intex uses advanced technologies in the construction of its products. Intex has been on the market since the 1960s! Mspa is one of the leading brands in the inflatable spa sector. It has a global reputation thanks to its high-quality products. Mspa Inflatable Spas are reliable products with advanced technology and a sophisticated design. 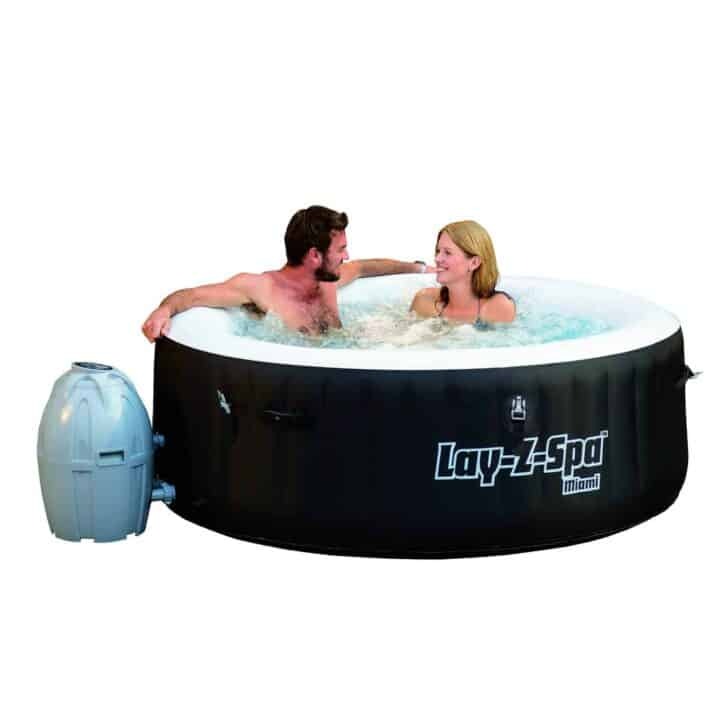 Ospazia inflatable hot tubs are also reliable products that you can orient yourself without worry. Easy to install and maintain, Ospazia products are of high quality and will not disappoint. If you are looking for an affordable yet quality spa, then review a Bestway Inflatable Spa. This brand has indeed a very interesting positioning since it has decided to launch reasonable products with high quality. They make hot tubs and swimming pools. If you want to build your own DIY pool, our Top 10 DIY Pool Ideas & Tips will help you! 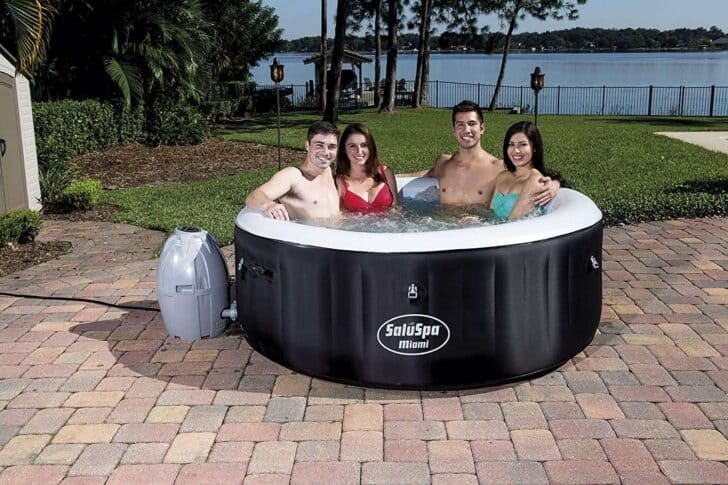 Bestway’s SaluSpa Miami is the world’s first premium inflatable spa. The SaluSpa Miami is a go-anywhere spa that can easily be set-up indoors or outdoors in minutes and it comfortably accommodates up to 4 adults. With almost a decade of advanced engineering innovations, the SaluSpa Miami provides an affordable spa experience, easy set-up (no tools required) and offers total relaxation. The SaluSpa Miami can be ready for water in minutes. The Rapid Heating System will heat up your spa quickly and safely. It features a Digital Control Panel to set the temperature you desire (up to 104 degrees F). Use the Control Panel to activate the SaluSpa Massage System, featuring 120 bubble jets perfect for soaking sore muscles, unwinding after a hard day at work or even as a luxurious treat for you and your partner to enjoy. The digital control panel allows you to turn up the heat without having to exit the tub. Your spa will remain fresh and clean with the proper use of the water filtration system and chemical floater. (Please see User Manual for details). Pamper yourself in relaxing heated water surrounded by soothing bubble jets. The PureSpa™ provides relaxation at the touch of a button for up to six people. The easy-to-use control panel activates the 170 high-powered bubble jets surrounding the interior of the spa for a refreshing massage. The heating system adjusts to fit your personal temperature preference, allowing a stress-free spa experience. PureSpa™ provides simple maintenance with 2 easy-to-replace filter cartridges for clean refreshing spa water. The built-in hard water treatment system makes water gentler on skin for a soothing experience.